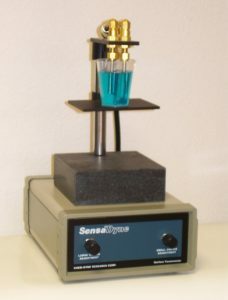 Each fluid or formulation has a unique molecular fingerprint that is the tangential intermolecular force that keeps the fluid or formulation together, expressed in Dynes/Centimeter (or milliNewtons/Meter). This parameter is the Fluid Surface Tension; the force that keeps the fluid together at any air/fluid interface.. If a pure fluid or formulation (no matter how complex) changes at the molecular level then fluid surface tension changes. Pure fluids and pure solvents have a single surface tension value called “static” or “equilibrium” surface tension. If the formulation contains “active” additives (such as surfactants or contaminants), then the formulation will have a “dynamic” surface tension; a dynamic “fingerprint” of surface tension versus surface age; surface age being the amount of time the process allows surfactant molecules in solution to migrate to any newly created air/fluid interface, where their purpose is to lower the surface tension. Surface tension dictates whether a formulation will wet and spread over, or retract from, a solid substrate. Any formulation exhibits both an adhesive force that is a measurement of the degree of association of the formulation for the substrate, and a cohesive force that is a measure of the degree of self-adhesion of the formulation. Spreading coefficient is the difference between work of adhesion and work of cohesion. If work of adhesion is greater than work of cohesion then spontaneous spreading occurs. If work of cohesion is greater than work of adhesion, then retraction occurs as the formulation will preferentially associate with itself. It is very essential, that formulators have a good understanding of the principles and relationships of surface tension, and surface energy or “wetting tension”. They must control fluid transfer and adhesion by developing formulations that perform well under widely varying application speeds and operating conditions.